René Schranzer, Alexander Rauscher, Evelin Haimburger, Kristian Bredies, Gernot Reishofer und Günther Grabner. Noise reduction in FLAIR2 images using Total Generalized Variation, Gaussian and Wiener filtering. Zeitschrift für Medizinische Physik, 28(4):286-292, 2018. C. Langkammer, F. Schweser, K. Shmueli, C. Kames, X. Li, L. Guo, C. Milovic, J. Kim, H. Wei, K. Bredies, S. Buch, Y. Guo, Z. Liu, J. Meineke, A. Rauscher, J. P. Marques und B. Bilgic. Quantitative susceptibility mapping: Report from the 2016 reconstruction challenge. Magnetic Resonance in Medicine, 79(3):1661-1673, 2018. G. Schramm, M. Holler, A. Rezaei, K. Vunckx, F. Knoll, K. Bredies, F. Boada und J. Nuyts. Evaluation of Parallel Level Sets and Bowsher's Method as Segmentation-Free Anatomical Priors for Time-of-Flight PET Reconstruction. IEEE Transactions on Medical Imaging, 37(2):590-603, 2018. Stefan Spann, Kamil S. Kazimierski, Christoph S. Aigner, Markus Kraiger, Kristian Bredies und Rudolf Stollberger. Spatio-temporal TGV denoising for ASL perfusion imaging. NeuroImage, 157:81-96, 2017. Daniel Stäb, Steffen Bollmann, Christian Langkammer, Kristian Bredies und Markus Barth. Accelerated mapping of magnetic susceptibility using 3D planes-on-a-paddlewheel (POP) EPI at ultra-high field strength. NMR in Biomedicine, 30(4), 2017. Ferdinand Schweser, Simon Daniel Robinson, Ludovic de Rochefort, Wei Lie und Kristian Bredies. An illustrated comparison of processing methods for phase MRI and QSM: removal of background field contributions from sources outside the region of interest. NMR in Biomedicine, 30(4), 2017. Florian Knoll, Martin Holler, Thomas Koesters, Ricardo Otazo, Kristian Bredies und Daniel Sodickson. Joint MR-PET reconstruction using a multi-channel image regularizer. IEEE Transactions on Medical Imaging, 36(1):1-16, 2017. Christian Langkammer, Kristian Bredies, Benedikt A. Poser, Markus Barth, Gernot Reishofer, Audrey Peiwen Fan, Berkin Bilgic, Franz Fazekas, Caterina Mainero und Stefan Ropele. Fast Quantitative Susceptibility Mapping using 3D EPI and Total Generalized Variation. NeuroImage, 111:622-630, 2015. Manuel Freiberger, Florian Knoll, Kristian Bredies, Hermann Scharfetter und Rudolf Stollberger. The Agile Library for Biomedical Image Reconstruction Using GPU Acceleration. Computing in Science & Engineering, 15(1):34-44, 2013. Heimo Wolinski, Kristian Bredies und Sepp D. Kohlwein. Quantitative imaging of lipid metabolism in yeast: from 4D analysis to high content screens of mutant libraries. Methods in Cell Biology, 108:345-365, 2012. Kristian Bredies. Weak solutions of linear degenerate parabolic equations and an application in image processing. Communications on Pure and Applied Analysis, 8(4):1203-1229, 2009. Thomas Bonesky, Kristian Bredies, Dirk A. Lorenz und Peter Maass. A generalized conditional gradient method for non-linear operator equations with sparsity constraints. Inverse Problems, 23(5):2041-2058, 2007. Florian Knoll, Martin Holler, Thomas Koesters, Kristian Bredies und Daniel K. Sodickson. Simultaneous PET-MRI reconstruction with vectorial second order total generalized variation. In: Proceedings of the 2015 IEEE Nuclear Science Symposium and Medical Imaging Conference (NSS/MIC), pp. 1-4, 2016. Kristian Bredies und Martin Holler. Artifact-Free Variational MPEG Decompression. In: Scale Space and Variational Methods in Computer Vision. Lecture Notes in Computer Science, 9087:216-228, 2015. Tuomo Valkonen, Kristian Bredies und Florian Knoll. TGV for diffusion tensors: A comparison of fidelity functions. In: Recent Progress in Regularization Theory, Minisymposium M5 of the 6th International Conference Inverse Problems: Modeling and Simulation. Journal of Inverse and Ill-Posed Problems, 21(3):355-377, 2013. Kristian Bredies und Martin Holler. Artifact-free decompression and zooming of JPEG compressed images with total generalized variation. In: Computer Vision, Imaging and Computer Graphics. Theory and Application. Communications in Computer and Information Science, 359:242-258, 2013. Kristian Bredies, Martin Holler, Florian Knoll, Karl Kunisch, Michael Pienn, Rudolf Stollberger und Tuomo Valkonen. Total generalized variation and applications to inverse problems in medical imaging. Oberwolfach Report 51/2012: Computational Inverse Problems, 9(4):3119-3121, 2012. Kristian Bredies. Variational Imaging with -regularization. Oberwolfach Report 07/2011: Trends in Mathematical Imaging and Surface Processing, 8(1):310-316, 2011. Kristian Bredies. An iterative thresholding-like algorithm for inverse problems with sparsity constraints in Banach space. Journal of Inverse and Ill-Posed Problems, Minisymposium - Recent progress in regularization theory, 4th International Conference: Inverse Problems: Modeling and Simulation, Fethiye 2008, 17(1):19-26, 2009. Kristian Bredies, Theodore Alexandrov, Jens Decker, Dirk A. Lorenz, und Herbert Thiele. Sparse deconvolution for peak picking and ion charge estimation in mass spectrometry. Proceedings of the 15th European Conference on Mathematics for Industry, 2008. Dirk Lorenz und Kristian Bredies. On the convergence speed of iterative methods for linear inverse problems with sparsity constraints. Journal of Physics: Conference Series 124:012031, 2008. Dirk Lorenz und Kristian Bredies. Iterated hard-thresholding for linear inverse problems with sparsity constraints. Proceedings in Applied Mathematics and Mechanics, Special Issue: Sixth International Congress on Industrial Applied Mathematics (ICIAM07) and GAMM Annual Meeting, Zürich 2007, 7(1):2060061-2060062, 2008. M. Kulesh, B. Berkels, K. Bredies, C. Garbe, J. F. Acher, M. S. Diallo, M. Droske, M. Holschneider, J. Hron, C. Kondermann, P. Maass, N. Olischläger, H.-O. Peitgen, T. Preusser, M. Rumpf, F. Scherbaum, S. Turek. Inverse Problems and Parameter Identification in Image Processing. 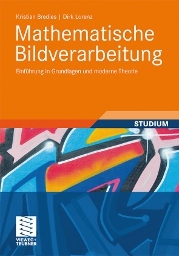 Mathematical Methods in Time Series Analysis and Digital Image Processing, Springer Verlag, 111-152, 2007. Peter Maass, Thomas Bonesky, Kristian Bredies und Dirk Lorenz. On the minimization of non-convex, non-differentiable functionals with an application to SPECT. Oberwolfach Report 34/2006: Mathematical Methods in Tomography, Oberwolfach Reports, 3(3):2076-2080, 2006. Kristian Bredies, Dirk A. Lorenz und Peter Maass. An optimal control problem in image processing. Proceedings in Applied Mathematics and Mechanics, 6:859-860, 2006. Kristian Bredies, Dirk A. Lorenz und Peter Maass. An optimal control problem in medical image processing. Systems, Control, Modeling and Optimization Proceedings of the 22nd IFIP TC7 Conference held from July 18-22, 2005, in Turin, Italy, 2005. Kristian Bredies, Dirk A. Lorenz, Peter Maass und Gerd Teschke. A partial differential equation for continuous non-linear shrinkage filtering and its application for analyzing MMG data. Proceedings of SPIE Conference Photonics East 2003, 5266:84-93, 2004.